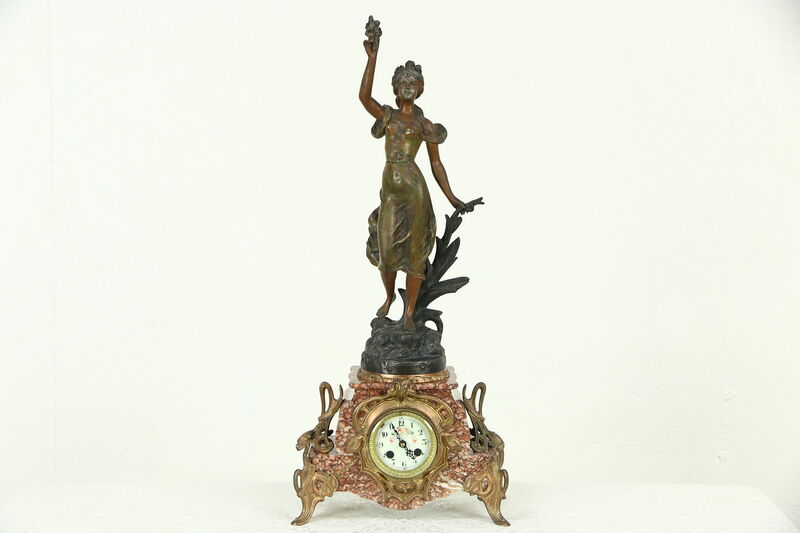 A French 1900 era marble mantel clock bears a sculpture of "Paquette" or Daisy, a young woman raising a bouquet of flowers. Signed "H. Guillemin," the cast metal statue has its original deep bronzey finish and a foundry stamp on the back.The barefoot and carefree young lady is standing on rocks in a garden. Noted sculptor, Emile Corolan Hippolyte Guillemin, lived 1841-1907. A carved rose marble base is in very fine condition. Coppery mounts show Art Nouveau influence on this European antique. A modern quartz battery movement is a replacement. Behind a beveled glass door, the hand painted porcelain dial has tiny chips and hairline cracks, see photos. Measurements are 12" wide, 6" deep and 27" tall.